By using this site you agree to be legally bound by these terms and conditions. If you do not agree to be bound by all the following terms please do not access and/or use this site. Links contained in this site may lead to other websites that are not under our control. Please be aware that the sensitive or confidential content should not be shared on this site. We do not warrant the accuracy, completeness, integrity or quality of any content on the site. 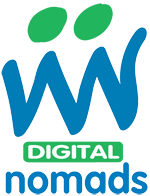 Digital Nomads endeavours to ensure that the information contained within the www.digital-nomads.com website is correct, but does not accept any liability for error or omission howsoever caused, whether by the negligence or omissions of Digital Nomads Limited or otherwise. Information, editorial, advertising, products and services provided by Digital Nomads Limited are provided on the basis that Digital Nomads Limited disclaims all warranties whether express or implied. Neither Digital Nomads Limited nor the suppliers of information shall be liable for any direct, indirect, incidental or consequential loss of business profits or special damages. This Company’s logo is a registered trademark of this Company in the United Kingdom. Our protected marks may not be used to infer association, recommendation or approval and may not be reproduced without express permission. Our contact details and a contact form can be found on our Contact Us page.